An upper ridge is persisting across south-central Europe, a short wave is affecting Scandinavia. A new short wave is pushing from the west of Iberia towards the UK. A weak upper low is still affecting S Balkans and areas towards SW Russia. 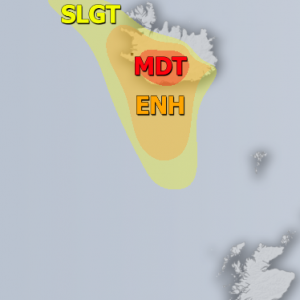 A SLGT+ risk has been issued for WNW France into S UK with threat for excessive rainfall and severe winds. Moderately unstable and sheared environment should support organized severe storms once they initiate along the N-wards advecting frontal boundary in W France and should tend to cluster into MCS towards UK overnight. 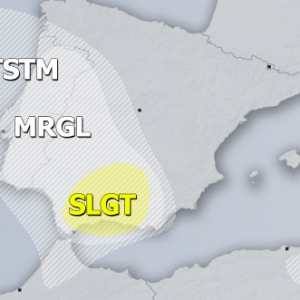 A SLGT risk has been issued for SW France into NE Iberia with threat for large hail and severe winds. 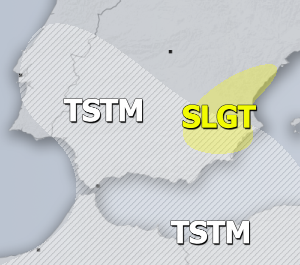 A SLGT risk has been issued for S Balkans with threat for excessive torrential rainfall with slow moving storms in strongly unstable and weakly sheared environment. A SLGT risk has been issued for extreme SW Russia into W Georgia with threat for heavy rain, severe winds and large hail. A TSTM+ area has been placed over Finland into NW Russia where another day of organized storms with excessive rainfall threat seem possible. Elsewhere, marginal thunderstorm areas have been placed where highest potential exist.